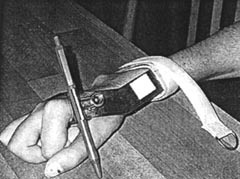 In this chapter, Gene Rodgers, a disabled North American activist, describes how he designed a pen holder to write with his paralyzed hand. 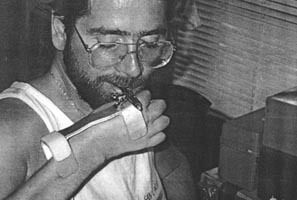 GENE, who is quadriplegic, was editor of the newsletter of The New Mexico Technology Assistance Program (NMTAP), an organization managed by disabled folks "to address the assistive technology needs of individuals with disabilities in New Mexico." 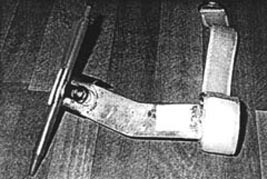 The story of his brace is included, in his own words, because it is a good example of how technologies are often more appropriate when the users are involved in designing them. It has been said that "necessity is the mother of invention." If that is the case, then common sense must be the father. I am a C-5 quadriplegic, paralyzed from the shoulders down. I can't use my hands to grip a pen, but I have enough movement in my shoulders to use a writing brace. When I went to college, I used a writing brace that was designed for me by an orthotist (a professional brace maker). The brace was heavy, long, and it cost several hundred dollars. It was impossible to put on and take off by myself. I got tired using it. I decided to make a brace that would work well for me. I started by listing the functions of the brace. It had to hold a pen or a pencil. It had to hold my wrist in place so my wrist wouldn't push around the writing paper. It had to be light, and easy to put on and take off. I used a piece of scrap metal, bent around my wrist and forearm to hold my wrist in place. I wanted to use 2 Velcro straps on the brace, to wrap around my forearm, but my friend who was making it only had time to put on one strap. As it turns out, one strap works fine. I put the brace on and take it off (with my teeth) in less than 5 seconds. 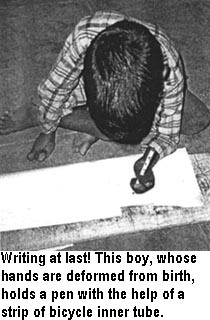 "To pick it up, I hook my fingers around the writing brace, and then put the pen in my mouth - which, in effect, allows me to grip the brace via the pen. 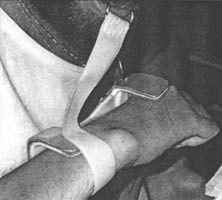 I position my arm under the brace, push the brace onto my arm with my chin, and rub the Velcro strap against the armrest to attach the strap to the brace." "To take it off, I grip the metal ring in my mouth and remove the strap." 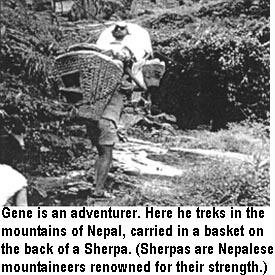 Long before he became quadriplegic as result of a fall from a cliff, Gene loved to climb mountains. As you can see from this photo, he has not let his disability prevent him from climbing even the most difficult mountains. 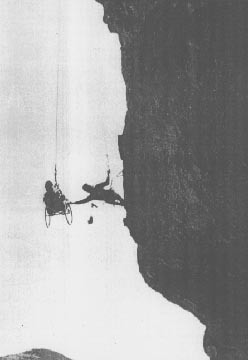 Here, a fellow climber helps him to rope-climb up a cliff-face in New Mexico. For Gene, the sky is the limit! 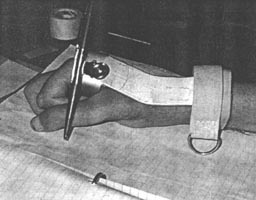 In designing a hand brace, Gene Rodgers had the idea of using a "bulldog clip" to grip the pen or pencil. 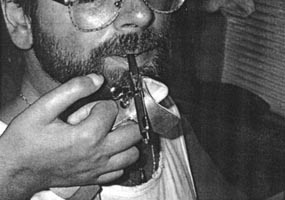 Similarly, other persons have used clothes pins (the kind with a wire spring). Here is a design, from an excellent book of simple assistive devices called More with Less (see page 344). Cut a strip of old bicycle inner-tube, about 3 x 20 cm. Make a small hole, big enough to stretch over the handle that you want to hold. Measure the width of your hand across the palm, and use this as the distance to the next hole. To put the device on the hand, put the handle of the instrument through one hole and place it on the palm. Use your teeth to pick up the other end of the rubber, and stretch it a little so that it goes over the other end of the instrument. It should be tight enough to give a firm grip. To hold larger tools like a hoe, this same man wrapped long strips of bicycle inner tube around his hands and the handle of the hoe many times. The elastic rubber allows a bit of "give" that is needed for the quick action and sudden jolt of hoeing - or for chopping with an axe.